It’s no secret that Venezuela is going through tough economic times: Shortages are rampant, citizens are waiting hours in line for groceries, low oil prices are hurting government revenues, and predictions of default on the country's debt are louder than ever. Still, Venezuela’s President Nicolas Maduro waxed optimistic during his state of the union address, mincing words over an unpopular currency devaluation scheme and promoting a boost in wages and social spending. He was immediately panned as ineffective and unable to cope with reality. In a three-hour speech Wednesday night, Maduro acknowledged some of the economic realities facing the country: The economy contracted by 2.8 percent in 2014 and inflation stood at 64 percent. “In the battle against our difficulties with low oil prices, the battle to optimize investment for socioeconomic growth, I call on all of Venezuela to unite for prosperity for all,” he said. 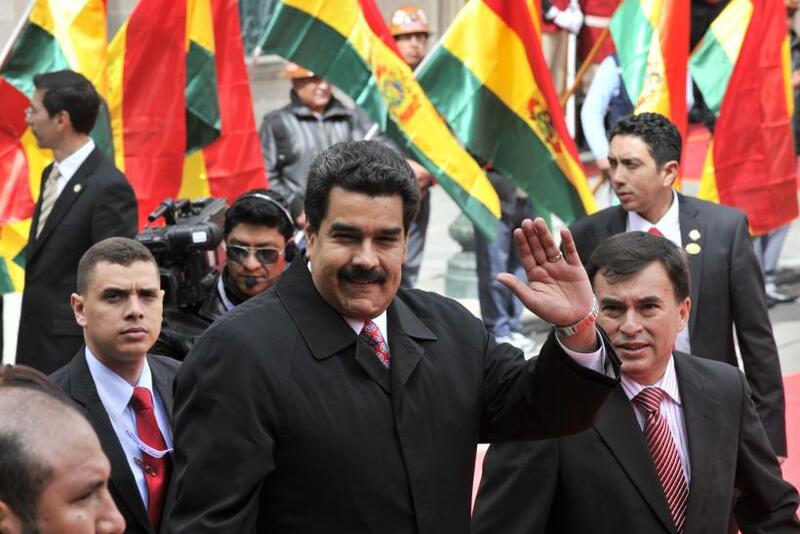 Maduro returned last week from a 10-day international tour aimed at shoring up financial assistance for the faltering economy and persuading members of oil-producing countries to strategize against falling oil prices. While he announced some investment deals with China and Qatar, he proved unsuccessful in changing the trajectory of the price of oil. “God will provide” on that front, he said during Wednesday night’s address. Some observers had been expecting him to announce a currency devaluation to cope with the country’s dwindling foreign reserves and runaway inflation. Maduro instead announced an adjustment to the existing three-tiered currency exchange system: The main exchange rate of 6.3 bolivares to the dollar would remain in place for food and medicine, while the other two tiers, which trade at 12 and 50 bolivares to the dollar, respectively, would be fused into one. The government would also establish a new, third exchange system using private brokers to counter the black market, where the currency trades at some 177 bolivares to the dollar, but Maduro offered few additional details on that system. Some analysts interpreted the announcement as a potential “stealth devaluation” that would indirectly weaken Venezuela’s currency. Maduro also referenced an impending hike in gas prices, a sensitive topic for a country that currently enjoys some of the cheapest gas in the world at roughly 2 cents a liter (about 8 cents a gallon). Meanwhile, he said, salaries and pensions would rise by 15 percent, and the government would build 400,000 new houses for Venezuela’s poor. Maduro’s popularity is at an all-time low as Venezuelans have felt increasing pain from shortages in recent weeks. Members of the political opposition have called for mass protests this weekend as a show of anger that could potentially balloon to the scale of last year’s chaotic demonstrations, which roiled the country for months. Wednesday’s speech seemed to do little to quell frustration for skeptics of the Socialist government. Opposition leader Henrique Capriles, who battled Maduro for the presidency in 2013, also took the opportunity to voice protest against the president on Twitter. “After today’s lies, what doubt remains that this government does not have the capacity to solve the country’s problems?” he wrote. Después de las mentiras de hoy,a quién no le quedó claro que este gob no tiene la capacidad de resolver los problemas del país? Meanwhile, international economists are still projecting a dire situation for the country this year. “The recent fall in oil prices means that 2014 may just have been a glimpse of much worse things to come in 2015,” wrote David Rees, emerging markets economist at Capital Economics, in a note Wednesday, adding that the chances of a default on foreign debt looked “increasingly likely.” He estimated Venezuela’s economy would shrink by 5 percent in 2015, while the International Monetary Fund unveiled a more drastic projection that it would contract 7 percent. Does Crude-Oil Price Slide Have Venezuela Back On The Brink? Is China Really Planning To Invest $20B In Venezuela?